Blending science and practice, this course is aimed at anyone with the ability, but not the formal qualifications, to join an honours degree. The foundation year is a platform for future success. Set yourself apart as an industry-ready sports therapist and rehabilitation specialist, fully prepared to go into practice after graduation. Starting your studies with a foundation year gives you all the support you need to excel. Demand for skilled and confident sport therapy professionals is running at an all-time high. This course ensures you are ideally placed to take full advantage of the exciting career opportunities ahead. By starting your degree with a foundation year, you’ll build vital skills, knowledge and confidence which will give you the edge throughout your future studies and career. You’ll cover core aspects of sport and exercise, human behaviour, human anatomy, physiology and physics while benefiting from extra support with academic study skills, research and data handling. The foundation year is a wise option if you want to pursue a new subject area or are exploring a potential career change. It also opens doors if you don’t have the necessary formal qualifications to enter our honours degree programme right away. Degrees of this kind are continuous, which means you won’t have to apply again to complete your full BSc (Hons) once you have completed the foundation year successfully. Clients and patients rely on sports therapists to help them reach optimum levels of functional, occupational and sports-specific fitness. As a professional working in this field, you’ll harness the principles of sport and exercise to help boost performance and develop injury prevention and rehabilitation programmes. You’ll also deliver assessments and treatments in a variety of recreational, training and competitive settings. This course offers a powerful blend of science and practice. You’ll gain in-depth knowledge of anatomy and movement while covering the rehabilitation process in all its aspects, including manual therapy techniques, exercise therapy, and sports massage. Throughout, we spotlight the latest research in this rapidly evolving discipline to help advance your practice as a therapist and ensure your work is informed by current thinking. Many jobs within sports therapy and rehabilitation today require applicants to be registered with The Society of Sports Therapists. Because our BSc (Hons) is accredited by the Society, you’ll graduate with a highly regarded and nationally recognised qualification, together with a professional standing. 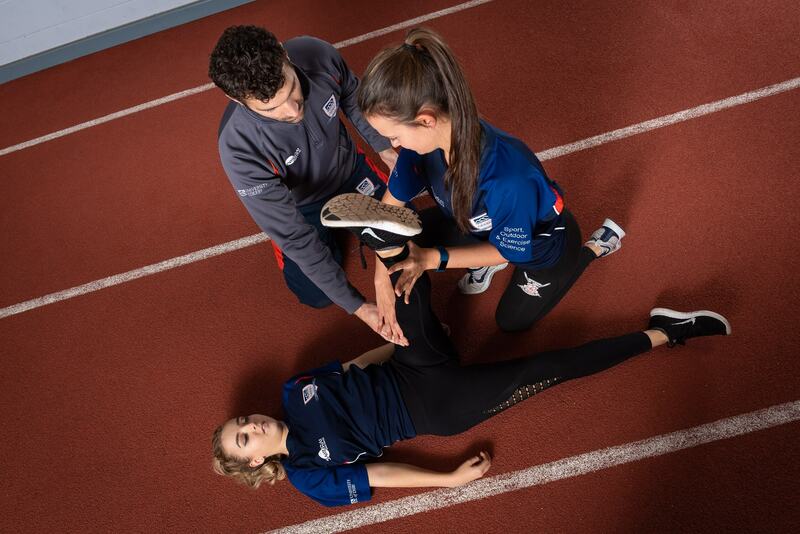 As the lead organisation for sports therapists in the UK, the Society gives its seal of approval to degrees which set high professional standards. When you start your course, you’ll therefore have the opportunity to become a member of the Society. Once you graduate, you’ll then be eligible to apply for full membership as a graduate sports therapist. This represents an important addition to your CV and will help you stand out when meeting potential employers. Your studies will be varied, inspirational and grounded in the realities of professional practice. No day is the same: you could be taking part in placements, heading off on fieldtrips, investigating real-world case studies, undertaking laboratory work or challenging yourself with problem-solving exercises. Opportunities for work placements are a cornerstone of this degree, enhancing your career prospects and ensuring you are ready to practise effectively once you graduate. You could gain hands-on experience with private therapy clinics or University sports teams, working with clients under expert supervision. Your clinical placements will amount to more than 200 hours overall. Our programme of fieldtrips is equally important in broadening your professional outlook. 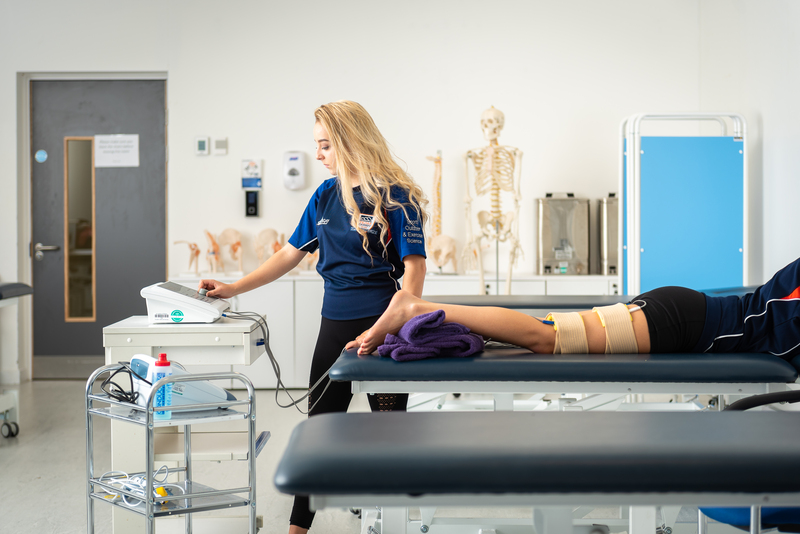 In the past, our students have visited sporting events such as 10-kilometre runs, half marathons and golf tournaments for a close-up view of the work of the sports therapist. You’ll be inspired and motivated by a teaching team with substantial expertise in sports therapy and rehabilitation, as well as wide-ranging partnerships with sports clubs. Such is the reputation of our staff that they are often called upon to provide consultancy services for elite track and field athletes, golfers and professional footballers. Thanks to our strong industry collaborations, our course features exciting opportunities for you to attend guest lectures, take part in demonstrations and undertake employer-led projects. Your learning experience – and your social life at University – will be enriched by the imposing facilities at our new £10.8m . You can improve your practical know-how in our dedicated sport therapy clinical teaching rooms. The centre also features a main hall, fitness gym with strength and conditioning area, studios, squash and badminton courts, an internal climbing wall, sprint track, changing rooms, treatment rooms and a café. With floodlit all-weather pitches and tennis courts adding to the picture, it means there is a wealth of opportunities to take part in a diverse range of sports – for elite performers and beginners alike. You’ll learn through a combination of clinics, lectures, practical sessions, seminars, laboratories, workshops, tutorials, and guided self-study. During your study, you will complete a number of work placements in our real world learning labs and, using the knowledge, skills, and understanding you acquire, you’ll learn to evaluate research and use it to develop your clinical decision making skills and inform your practice as a therapist. The course assesses the professional, academic, and scientific skills considered key to becoming a research savvy, industry-ready sports therapist and rehabilitator. Assessments will include oral presentations, structured clinical examinations, written projects, problem solving exercises, laboratory reports, professional development work, exercise prescription tasks, essays, practical viva voce, and case studies. Because this course is aligned to the professional guidelines set out by The Society of Sports Therapists, you’ll be fully prepared to go into practice as an injury and exercise-based rehabilitation and fitness specialist. You can also progress to roles working in multi-disciplinary or inter-disciplinary healthcare teams. Your qualification also puts you on the pathway to postgraduate education, including the exciting and innovative masters courses available at Derby. You could consider our MRes Sport and Exercise programme or our MSc Applied Sport and Exercise Science.